Ever use prayer as nothing more than an emergency call or a cold call to God? Pray only when we need or want something from God? – It is understandable that we are inclinded to do that, considering the English word “pray” means to “ask or beg”. But the Hebrew word for prayer – tefillah – means to “self evaluate”. So to the Jews of the Bible, prayer was not a time when they asked God for things … it was a time when they examined themselves. They would use prayer as a way to compare their actions, behavior and attitude against God’s holiness. Alexx devo – take 2 and call & call me in the morning. 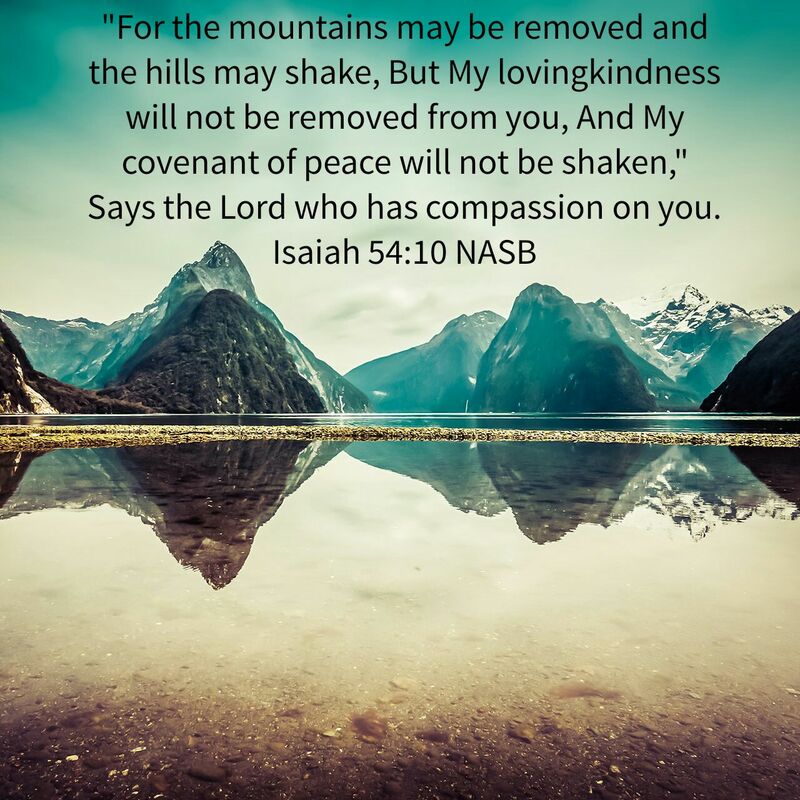 in His presence the mountain quake, and the hills melt away; the earth trembles, and it’s people are destroyed. My son does 2 devotional thoughts a day, sends them via text to 50 some people. Then he post them to his blog (https://lexbailey.wordpress.com/). Eventually he is going to put them all together and publish them into a hard back book giving the reader 2 Bible verses with devoted thoughts that go along with those Scripture verses. The red sea literally ran in both directions from God’s power making dry land for His people. Another time the sun stood in its tracks for a whole day at His command. The entire earth trembled at His death. Why is it that everything else in the universe besides humans submit to His power? We are the only beings in existance with the gift to truly understand what it means to have grace, faith, and the beauty in truly embracing a one on one relationship with God and yet we seem to also be the only ones who don’t understand. We take advantage of the greatest gift ever made and the worst part is that we’re not ignorant, we have had ample opportunity to learn, know, and comprehend we simply choose ignorance but the truth is that Ignorance is not always bliss. Your Kids Matter to God! 🔸The Question: What does a godly parent look like? ☆1. Godly parenting begins with positive, clear-cut Objectives ! ☆2. Godly parenting demands we practice we preach. ☆3. Godly parents build relationships that bond.
. . . 7 but we were gentle among you, like a mother caring for her little children. 8 We loved you so much that we were delighted to share with you not only the gospel of God but our lives as well, because you had become so dear to us. calls you into His kingdom and glory. ● 5 Magic Words – ______________ _______________! ● It’s Never Too Late! 1. On a scale of 1 to 10, how positive of a parent are you? 2. Discuss which point was most helpful to you. Why? Click here 👉Go to part 2👈to go on. Remontant: Word of the Day with ‘The Word’ for the day. Hmmm… the seed God planted in me bloomed and the more I feed on His Word and develop the relationship He has given me (His Holy Spirit in me) the more I bloom, every day. For me God doesn’t just have 3 or 4 months to show His goodness, His blessings. He doesn’t just give winter, spring, summer & fall. God works out everything for the good for those that love/trust Him. I praise God, no matter what season I am going through. It amazes me how what I thought was something “bad” that happens God ends up using that same situation to show me how blessed I truly am. May I be blooming more than once in a season, let alone blooming in and out of season, year around. May all of us who bear the name “Christ”ian always be ready in any season (time period) to bloom (show the fruit of) The Holy Spirit. To go to: “Season of Jail” (part one) a story I am writing regarding a man going through a very tough season. How to Escape the Rat Race Forever!! Introduction: Are you “clearing cobwebs” or “killing spiders”? The root problem in priority living according to Jesus is ____________________. serve both God and Money. Question: How can we live in a material world without becoming materialistic? The Symptom: Anxiety is the mark of a life preoccupied with material things. If you will pursue knowing Christ and making Him known as your first priority, He will meet all your material needs. • Are you “spending” or “investing” your life? • Is your life making a significant difference in the lives of others? • Do you live under “pressure” or under “priorities“? known is your #1 priority? All on Balancing Life’s Demands, Biblical backing. Compared what you’ve heard with What Jesus says. Jesus is concerned with the internal person. The law was all about works alone. Jesus is more concerned with us being like Him. Again the law focused on obligation. Jesus interested in true Devotion. The law was a way to show (and became a way to ‘show off’ how ‘dedicated’ people were to God. Jesus is interested in a true love relationship and things done from a loving heart for and with Him, not just a performance piece. The law increased Guilt because humans are not able to fulfill it. Jesus gives grace & did what we cannot. The letter of the law can’t be relied on but His Holy Spirit can fill us and make us pleasing to Him. The law was something to wrap humans head around. Jesus wants our heart. The law served its purpose. Then Jesus came, made a new covenant, new promise, New Testament. Now we live like Him, for Him by grace, not under law. Hear what Jesus is saying. It can be listened to by itself or as a series. To what degree have you taken specific steps in the following areas? kind of person I want to become and what I want to accomplish. and eternal in my daily life. 🔸____ 🔸Discipline: Doing what needs to be done when it needs to be done (i.e. more fully enjoy long-term success). keep my commitments to God. The law served its purpose then Jesus came, made a new covenant, new promise, New Testament. Whole Christian life in one word = Abide. when it does not flow from ____________________ relationship with God. You can give without loving but you can’t love without giving. deepen our ____________________ with God. Application: ___________________ is God’s method of keeping our motives pure. who are we seeking to please? spiritual lives: the principles of distortion and deception. 3. What aspect of this message hit “closest to home” with you? Why? righteousness in your life right now? What Kind of Love does God offer? The Hebrew word translated as ‘love’ here is “hesed’ which is a hard word to define. Theologian John Oswalt says hesed is “… a completely undeserved kindness and generosity …”. Hesed is not just a feeling, it’s an action. It “… intervenes on behalf of loved ones and comes to their rescue” according to Lois Tverberg. Hesed is not romantic love. It’s faithful. It’s reliable. It’s a wife praying for years for her husband to know God. It’s a dad once again bailing out his drug-addicted son. It’s parents who lovingly care daily for their autistic child. Today, you can rely on God’s ‘hesed’ for you no matter what you face. The Problem: Many start well, but few finish well. • Definition: Biblical Accountability is enlisting the support of those who love me to help me keep my commitments to God. keep warm alone? 12 Though one may be overpowered, two can defend themselves. 1. Because we never outgrow the need for________________ ___________________. slave, so that, after I have preached to others, I myself will not be disqualified. 2. Because past successes are no guarantee of ______________ _______________. were laid low in the wilderness. Note above: we can learn from result of others choices, they Crave evil things, idolaters (anything or anyone who take the place of The Lord), act immorally, try (test), grumble. 4. Because we constantly overestimate our ability to handle ______________. 5. Because we naively believe our struggles and temptations are _____________. temptation will provide the way of escape also, so that you will be able to endure it. • It begins at ________________. • In an atmosphere of ___________ . • It must be voluntary and by __________________. Allow the Holy Spirit to do His work in you and others. • It must be _______________ , not generic. • It must be ________________ , not sporadic. • No more than _________ _____________. 1. In what area of your life have you recently made a commitment to God? 2. From what you learned today, how could you get help in keeping this commitment? 3. Why is accountability so essential for all of us? 4. What specific steps will you take to become accountable so you can be a finisher? ask God to give you a picture of what he wants to say to you, and then write down God’s responses to your questions. In the book of Habakkuk, the Lord commands the author to “write down clearly on tablets what I reveal to you, so that it can be read at a glance” (Habakkuk 2:2 TEV). That’s how we got the book of Habakkuk. In chapter one, Habakkuk wrote down what he said to God. And in chapter two, he wrote down what God said back to him. it is David’s quiet time. David meditated on the first five books of the Bible, the Torah, and then he wrote down his thoughts, and they’re called psalms. In many of the psalms, he starts out with what he’s feeling and then ends up with what God says. Is it OK to write out a prayer and then read it? Of course it is. When you’re writing it, you’re praying. When you’re reading it, you’re praying. A journal is not a diary. A diary is about the things you did. A journal is about the lessons you learned — the mistakes you made and how you learned from those things. Click 👉Prayer Journalism Series for info. On how i keep a prayer journal. picture at top with Scripture superimposed over it is from my parents back yard where i often meditated on God’s Word & just sat & listened.